Hours: Sunday: 11 a.m. to 7 p.m.; Monday – closed; Tuesday to Thursday: 11 a.m. to 9 p.m.; Friday-Saturday: 11 a.m. to 10 p.m. Yes, the Lenten season is here. A time of prayer, repentance and fasting. Growing up, it was a time to give up something, more often than not a personal sacrifice in the form of abstinence from a favorite food. With age it seems to be shifting to doing something good, something outside of our normal routine for others. Feasts don’t really seem appropriate during Lent, a time when we should be resisting temptation. But it was actually a feast with the Lenten season in mind that brought us to Bogey’s. Bogey’s has been in operation for eight years now on Upland Avenue in Lowellville. During this time, it has established a well-known and solid reputation for serving good food at affordable prices. Recently, the facility underwent some remodeling to update its bar and ample dining area. New lighting, booths, chairs, paint and artwork have freshened up the d cor and the new countertop around the bar gives a comfortable, warm place to gather to sample one of their 20-plus rotating beers on tap. We met up with co-owner and Chef Melvin McKee. At 40 years of age, and more than half his life in the food business, Chef McKee’s desire is to make Bogey’s a Youngstown landmark. “We use quality products and have a well-rounded menu with options for every taste,” McKee remarked. Our meal began with one of Bogey’s’ Signature appetizers, Italian Egg Rolls. Chef McKee takes egg roll wrappers and stuffs them with diced Roma tomatoes, Italian greens and a blend of a trio of cheeses. The egg rolls are then deep fried and served with their homemade marinara on the side. The wrapper was crispy yet chewy. The filling was full of melted cheese and garlicky greens. The marinara added some bright acidity and made for a great starter. Fantastic. Chef explained to us they have Wedding Soup on their menu every day, but on Fridays, he features homemade New England clam chowder. This dish starts with a saut of carrots, onions and celery. Then, a roux is made with flour and butter to develop a nutty base to which heavy cream, potatoes and chopped clams are added. The rich chowder was full of vegetables and chunks of tender clams. A comforting version of a classic dish. Like most restaurants, Bogey’s features fish on Fridays during Lent. They have a “5 Way Fish Friday” featuring haddock prepared five ways. We were lucky enough to try four of the entrees. First up was Haddock Almandine. 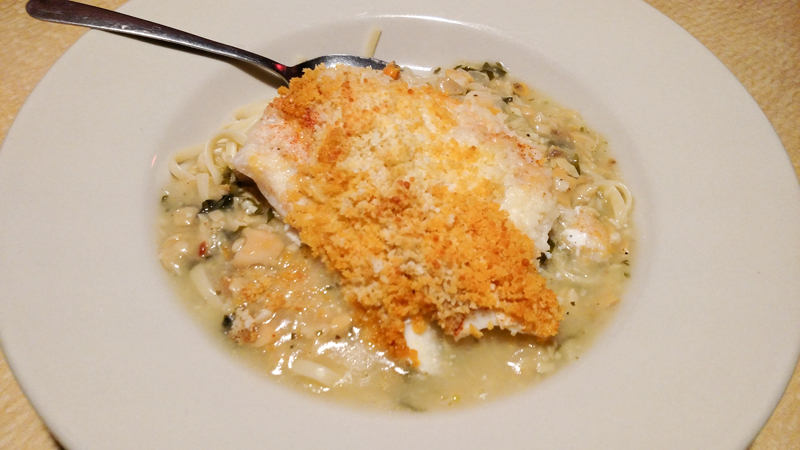 Chef bakes a generous haddock filet and serves it on a bed of Italian greens. The fish is then topped with toasted almond slivers. The fish was nicely cooked. The greens were outstanding, tender with just the right amount of garlic flavor. The slightly browned almonds gave the dish some saltiness and texture. A well rounded, satisfying dish. Next up was Haddock Italiano. Again, Chef bakes a haddock filet but, this time tops it with bell peppers and mushrooms that have been saut ed in their flavorful marinara sauce. The mild flavor of the fish paired well with the sweet peppers and the tastiness of the plum tomato red sauce. The fresh bread was perfect for sopping up the sauce. The third offering we sampled was Clam Sauce Au Gratin. This turn takes a haddock filet that is crusted with bread crumbs and parmesan cheese that is then broiled to a golden crust. This is set on top of linguini with your choice of red or white clam sauce. We opted for the white sauce. The pasta was cooked perfectly al dente. The white clam sauce had nice balance of garlic, lemon and white wine and a touch of pepper flakes. The bread-crumb crust gave a little texture to the fish. A comforting dish. Lastly, we tried Haddock Francaise. The fish filet is lightly egg battered and saut ed in sherry and lemon butter sauce and served over angel hair pasta. The sauce was amazing. Just the right amount of flavor from the sherry with nice tartness from the lemon. The pasta was the perfect accompaniment. A superb plate and our favorite entr e of the night. Certainly on this excursion, we indulged our appetites rather than practiced any culinary abstinence. If you plan to go out for fish on Friday, Bogey’s serves up a feast. And since you won’t be deprived, try to make up for it by doing something good. Give up social media, put down your smart phone and spend time reconnecting to people over the dinner table. If you want to drop us a line and tell us where to go next, just email us a brothersinfood@gmail.com. March 21, 2012 12:01 a.m.
June 10, 2015 12:05 a.m.